The Bruins closed down the Little Britain Merchants on the road earlier tonight, skating to a 6-3 victory. The Bruins skated to a 7-1 win against the Georgina Ice on Friday, Nov. 23 at the Bear Den. Please subscribe to the Bruins official YouTube page for exclusive PJHL highlights from the Bear Den. 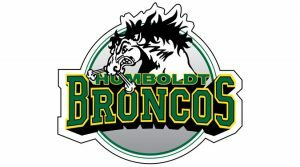 Comments Off on Thank you Humboldt Broncos Chaplain Sean Brandow! Thank you Humboldt Broncos Chaplain Sean Brandow! The Uxbridge Bruins were proud to welcome the Humboldt Broncos’ Team Chaplain Sean Brandow to the Bear Den tonight for our 7-1 victory over the Georgina Ice. A Justin Bennett goal late in the first period gave Uxbridge a 1-0 advantage. The Bruins roared to life in the second period, and rolled to a 6-0 lead behind goals from Jackson Savery, Aiden Reilly, Daniel Giorgio, Travis Buxcey and Cameron Moffitt. The third period saw Robert Freckelton score for Uxbridge, while Ryan McConkey turned aside 22 shots by the Ice to pick up his 7th win of the season. The Bruins are back in action tomorrow night, making their first trip of the season to Little Britain for a 7:30 p.m. match-up against the Merchants. Next Friday night, the Bruins will host the Campbellford Rebels at the Bear Den, with the action getting underway at 7:45 p.m. Photos courtesy of Peter Ovens. 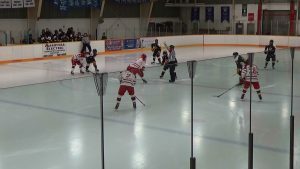 The Uxbridge Bruins were in Port Hope Saturday evening to take on the Panthers of the Tod division. A one goal game with both teams exchanging the lead. Panthers tied it up late in the third that sent it to overtime. Toby Cooper found the bottom corner from a pass from Daniel Giorgio in the 3 on 3 OT to take the win 3-2. Other goals were from Michael Rennie and Jackson Savery. Jacob Gordon received first star for stopping 38 of 40 shots. Next game is in Uxbridge Nov. 23rd @ 7:45 pm. 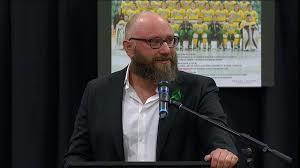 Bruins will welcome Humboldt Broncos Chaplain Sean Brandow. 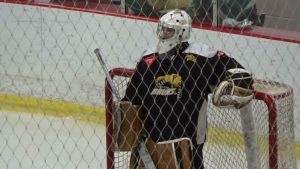 The Uxbridge Bruins hosted the Napanee Raiders on Friday evening. This was the second meeting in the East conference interlock schedule. Both teams exchanged the lead throughout the game, but the Raiders would outlast Uxbridge winning 3-2. Bruins goals came from Freckelton and Savery. Ryan McConkey stood tall and kept the boys in it, stopping 35 of 38 shots. The Bruins visit Port Hope tomorrow @ 7:30 pm. Comments Off on Bruins beat Chiefs in OT! Bruins beat Chiefs in OT! 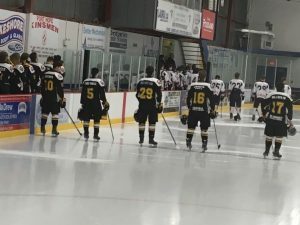 In one of the most thrilling PJHL games of the season, the Bruins took down the defending Clarence Schmalz Cup provincial champion Lakefield Chiefs in overtime at the Bear Den, extending Uxbridge’s season-opening home ice win streak to 9 games. Tensions were running high through a scoreless first period that saw several spectacular saves at both ends of the ice. The Chiefs took the lead early in the second period before timely goals by Toby Cooper and Justin Bennett put Uxbridge ahead 2-1. However, the lead would not last, and at the end of the middle frame, the Bruins were trailing 3-2. 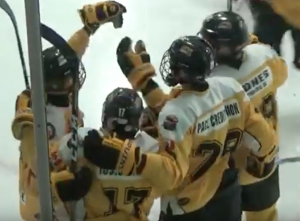 An unassisted goal by Daniel Wu early in the third period knotted the game once more before the Chiefs took back the lead with slightly more than 10 minutes to play in regulation. The Bruins continued to try and claw their way back, using their superior size to create space in the offensive zone. A pair of late penalties put the Bruins’ resilience to the test, but a pair of veterans proved to be more than up to the task as captain Aiden Reilly found Robert Freckelton for a dramatic shorthanded goal that trickled over the goal line with just over one minute remaining on the clock to force overtime. 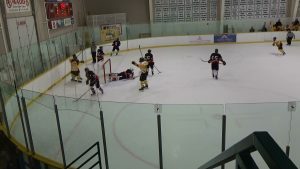 There was a blistering pace to the 4-on-4 overtime period – that began 4-on-3 with a spectacular effort from the Uxbridge penalty killing unit – and 1:34 into the extra frame, Justin Bennett capitalized on a Lakefield turnover, finding Jackson Savery charging to the net for the game winning goal as the boisterous Uxbridge crowd erupted in cheers. The Bruins will be back in action next Friday night at the Bear Den, with another tough test, as the Tod Division-leading Napanee Raiders visit for a 7:45 p.m. match-up. 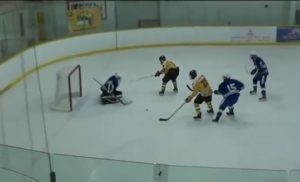 Please subscribe to the Bruins’ official YouTube page for exclusive PJHL highlights from the Bear Den. The Uxbridge Bruins would like to thank Uxbridge Branch 170 Royal Canadian Legion, 76 Uxbridge Army Cadets, the Legion Pipe and Drums band as well as anthem singer Erin Briggs for their part in Friday night’s Remembrance Day opening ceremony. The Bruins organization thanks all of Canada’s veterans and current military members for their service to our country. That day, Sean’s team was devastated in a horrific bus crash that claimed the lives of 16 and injured 13. The news spread quickly with every hockey team, every hockey family and every hockey town in Canada immediately touched deeply by the tragedy. 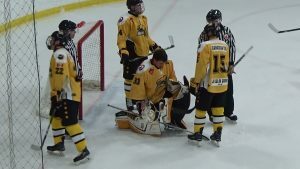 The Uxbridge Bruins erased Clarington’s 3-0 lead in the second period behind four consecutive goals from Justin Bennett to score a 7-3 victory and maintain an 8-game winning streak on home ice to start the PJHL season. Bennett broke up the Eagles’ shutout bid just past the midpoint of the second period, adding another powerplay goal almost five minutes later to cut the deficit to 1. With under 2 minutes to play in the second period, Bennett completed the natural hat trick to knot the game 3-3 heading into the final frame. Another powerplay goal by Bennett less than 3 minutes into the third period gave the Bruins their first lead of the evening, and they would keep rolling as the game drew to a close. Goals from Jackson Savery, Robert Freckelton and Adam Turner down the stretch put the game away for the home side. Jacob Gordon did an outstanding job of shutting down the Eagles offence in the second and third periods, stopping 18 of 19 shots. Uxbridge would outshoot the Eagles by a final margin of 45-30. The next game for the Bruins is a road match-up against the Picton Pirates on Sunday evening. The Bruins will be looking to sweep the season series after a 4-3 overtime win over Picton at the Bear Den on Thanksgiving weekend. Videographer Aiden Berghout captured this highlight package. Please subscribe to the Bruins official YouTube channel for more exclusive PJHL highlights.